This Cassini image hints at the split personality of Saturn's 1,436 kilometer (892 mile)-wide moon Iapetus. The Voyager spacecraft first imaged this curious yin-yang moon, with its light and dark hemispheres. The dark hemisphere is the side of Iapetus that leads in its orbit. In this view, both light and dark areas are visible. 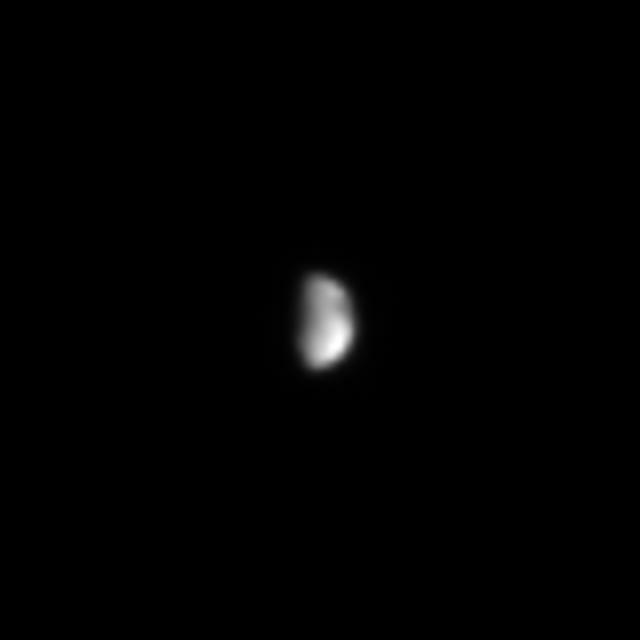 The image was taken in visible light with the Cassini spacecraft's narrow angle camera on May 23, 2004, from a distance of 20.2 million kilometers (12.5 million miles) from Iapetus. The image scale is 121 kilometers (75 miles) per pixel. The image was magnified to aid visibility.